I am deep in the depths of engineering coordination for the renovation, but this weekend we did get one thing done (and other things started, but nothing really photo-worthy): Noel wired the thermostat in place. Yeah, not a big deal, but when the thermostat was originally installed it was just kind of tacked in place on the wall. Noel ran conduit so we could rewire it in the future or replace/modify as needed. 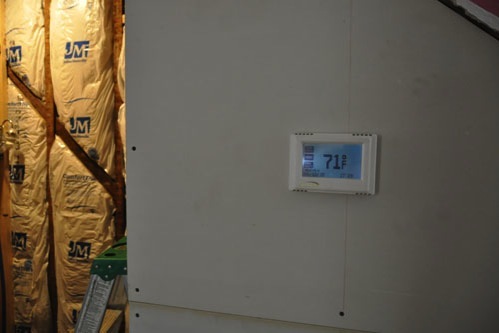 Not that we want to right now; this is a pretty nice programmable thermostat and it meets our needs. I'm not crazy about going with things like the Nest that spy on your house and send data off to the manufacturer, and we actually have a really regular schedule day-to-day. 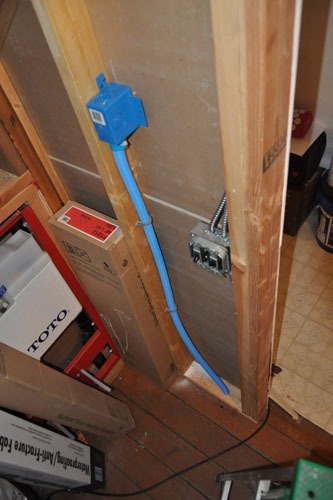 Anyway, pretty simple setup: conduit runs up to a box behind the drywall, then the wires run out of a small hole in the drywall to the thermostat. Not that we actually need the thermostat for several months, since it is now basically summer here. Actually, we will probably not use this thermostat until next year at this point. That's an interesting thing to ponder. We have used the air conditioner a couple of times in the last week, which is unusual for this time of year. In other parts of the house we have started going through the basement to get rid of materials and tools we've saved up for years and will not need any more. We will be having an all-tools garage sale of some kind in the upcoming weeks. I kind of hate having garage sales but they are remarkably effective for getting rid of things. And a lot of things need to be gotten rid of. So there you go.